Samsung Portable SSD X5 is a revolutionary external storage with integrated cutting-edge NVMe™ and Thunderbolt™ 3 technologies. The X5 is designed for content creators and high-tech professionals who need fast and secure access to data in a lightweight and compact storage solution. Available in capacities of 500GB, 1TB & even an industry leading 2TB. Its lightning-fast speed, high capacity and storing data protection allow leading content creators to handle high-resolution contents faster and more securely on the go. Samsung Portable SSD X5 leverages technological synergies between NVMe™ and Thunderbolt™ 3 technologies, offering a remarkably fast interface of up to 40Gbps bandwidth. The X5 delivers read/write speeds of up to 2,800/2,300 MB/s* respectively, which is more than five times faster than current USB 3.1 Portable SSD (SATA-based) and more than twenty-five times faster than an external HDD. Inspired by a supercar, the X5’s dynamic design is optimized for performance and reliability. Using a durable yet light magnesium full metal body and internal structure, the X5 withstands drops of up to two meters (6.6 feet). The X5 integrates the advanced thermal management technologies. The Dynamic Thermal Guard technology safeguards against overheating by automatically maintaining optimal operating temperatures, while a heat sink - a mechanical internal solution – further lowers the overall SSD temperature as a way to minimize thermal influence while maximizing performance. With Dynamic Thermal Guard and the mechanical solution technology, the surface temperature of the X5 is kept below 45°C. • Magnesium metal body design. • Non-slip due to matte bottom. • Shock resistance from up to 2m. • Surface temperature below 45°C. The X5 offers powerful data protection through Samsung Portable SSD software. You can conveniently manage access to your X5 using password protection based on AES 256-bit hardware encryption. Features • High Performance, High Capacity Portable SSD. • Utilises lightning-quick NVMe technology for Read & Write speeds of over 2000MB/s. • Easily connects to your devices using the 40Gbps reversible Thunderbolt 3 interface. • Keeps your files secure with password protection & AES 256-bit hardware encryption. • Durable Magnesium construction & shock resistant up to 2m. • Compatible with Windows 10 PCs & Apple Macs using OS X Sierra. Important – Please Note: Only compatible with Macs and Windows PCs with Thunderbolt™ 3 ports, Mac OS X Sierra, High Sierra (10.12 or higher) Windows 10 64bitRS 2 or higher. Not compatible with PCs only with USB interface. 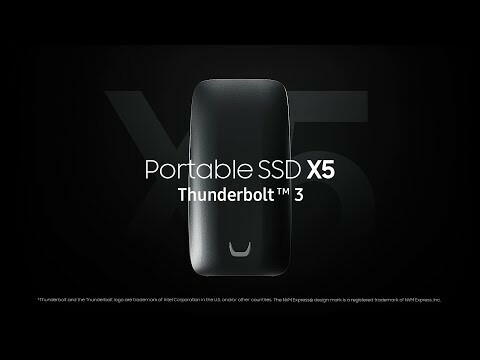 Read & Write Speeds shown are for the 1TB & 2TB Portable SSD X5’s, other capacities may be slower. Software updates for X5 are only supported on Windows PCs. Samsung Electronics shall not be liable for any loss, including but not limited to loss of data or other information contained on Samsung Electronics product or loss of profit or revenue which may be incurred by user. 500GB Samsung Portable SSD X5, Thunderbolt3 External + USB-C NVMe SSD, 2800MB/s Read, 2100MB/s Write is rated 4.0 out of 5 by 1. Will this work though a Thunderbolt 2 adapter? I have an older imac with thunderbolt 2 if i get the tb 2-3 converter cable will this work as an external drive to boot from? I have just submitted a review of the X5, This is very new and therefore future forward technology. It does not work with USB 3 and a google search has verified that it is NOT compatible with TB 1 &amp; TB 2. The Samsung T5 may be an alternative, having used this drive on TB3 iMac and USB 3 on a Mac mini 2012 which gives surprising speed. Sorry if this disappoints.